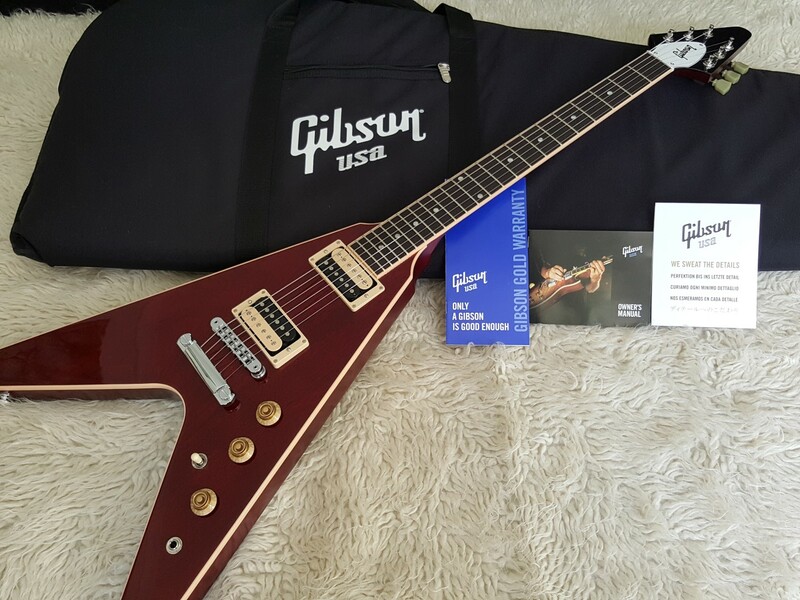 New Gibson Flying V 2016 T - Wine Red. Unplayed, mint, not been a demo. Solidbody Electric Guitar with Mahogany Body, Mahogany Neck, Bound Rosewood Fingerboard, and 2 Humbucking Pickups. Add a new look to your collection with the 2016 Gibson Flying V. This guitar uses Grade A mahogany for the body and neck, a fast-playing 1-piece rosewood fretboard, and a pair of genuine Gibson humbuckers. You'll love the '50s-inspired curves and smooth playability of the Flying V. Add a little attitude to your rig with the Gibson Flying V.
The Gibson Flying V features authentic Gibson '57 Classic and Burstbucker 3 zebra pickups that give you everything you need for iconic humbucker tones. From smooth and sultry clean tones to raging rock leads, this stellar axe covers the entire range. This Gibson Flying V gives you the smooth feel and fast action of Gibson's Flying V slim profile neck. Early Les Pauls had huge necks, but by 1960 the neck underwent several modifications, eventually becoming the standard SlimTaper carve. And when you add to that the ultra-smooth feel of its bound rosewood fingerboard, you get the best of both comfort and performance. A gorgeous nitrocellulose lacquer finish. Nitro finishes - standard back in the day - are significantly thinner than today's polyurethane finishes, allowing the guitar to breathe. Nitro finishes not only look vintage-y wonderful, but they also enhance the instrument's tonal qualities. Comes with Gibson heavy padded Gig Bag.